As in other highly sexually dimorphic, group-living animals, reproduction in gorillas has been largely viewed as the outcome of competition among males. However, females may exert choice via dispersal decisions or choice of partner in multimale groups, and males may also mate selectively. Here, we examine the paternity of 79 wild mountain gorilla offspring born into four groups characterized by stable dominance hierarchies and the presence of mature offspring of the dominant male. We found that on average the dominant male sires the majority (72 %) of the offspring in stable multimale groups and subordinate males also produce offspring, particularly when dominant males become older or the number of competing males increases. Although expected to disperse to avoid inbreeding, only half of the maturing daughters of dominant males left the group in which their father maintained dominance. However, in all five cases of reproduction by a resident daughter of a dominant male, a subordinate male was the sire of the offspring. 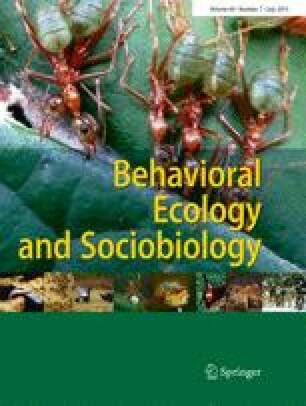 As females commonly initiate and end copulations, and dominant males may prefer mating with fully mature females, both male and female mate preferences in addition to male competition apparently play a role in reproductive patterns in multimale groups, emphasizing the complexity of social dynamics in one of our closest living relatives. The online version of this article (doi: 10.1007/s00265-015-1930-0) contains supplementary material, which is available to authorized users. We gratefully acknowledge the Rwandan Government and National Park authorities for their long-term commitment to gorilla conservation and support of the Karisoke Research Center. The authors express their gratitude to the many Karisoke field assistants and researchers who painstakingly gathered the decades of demographic and genetic data used in this study, and in particular V. Vecellio and F. Ndagijimana for their work in coordinating these efforts. We thank C. Lang and A. Abraham for contributing to the laboratory analyses, M. Schreiber for drawing the figure, and D. Lukas and A. Robbins for discussion. This research was financially supported by the Max Planck Society. The Dian Fossey Gorilla Fund International (DFGFI) also gratefully acknowledges the public and private agencies, foundations, and individuals that have provided support for the Karisoke Research Center (see www.gorillafund.org for a list of supporters). All research complied with the laws of the countries in which it was performed.